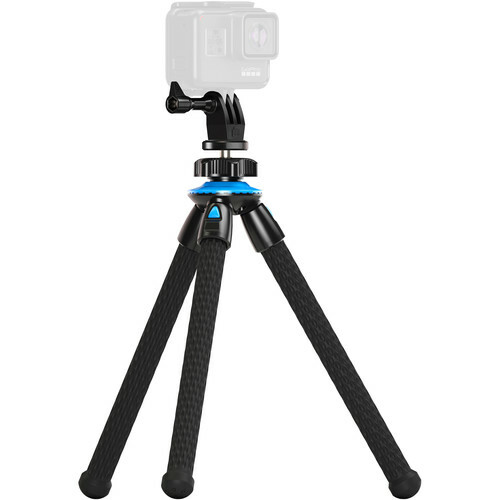 The GoPole FlexBase 12" Flexible Tripod includes a GoPro connector and a mobile clip, which is compatible with smartphones between 2.1 to 3.2" wide. GoPro cameras can attach directly to the included connector, which secures with a hi-torque thumbscrew. At the same time, both connector and clip screw onto a standard 1/4"-20 threaded mount at the top of the FlexBase, which supports small point-and-shoot or mirrorless cameras. Furthermore, the 10.5 oz tripod with its flexible, non-slip rubber legs can wrap around most railings, poles, and tree branches, so the FlexBase can practically set up anywhere. Box Dimensions (LxWxH) 11.75 x 2.5 x 2.5"